Want to Visit NZ ? The soon to be most populated country on earth and they all want a minute of your time (that would add up to 2000 years!). A classed society with the full range from poverty to decadence, annoyingly including a brown nosing bureaucracy, and with so much competition for limited resources that it’s all who you know (being a westerner you understand what it’s like to be the prettiest girl at the school dance). I’ve never seen such a spectacle as on the Indian roads – roamed by “sacred” cows, monkeys, piles of rubbish, families on motorbikes, more rubbish, kids and mothers with babies begging, richshaws, tuk-tuk’s, buses and cheerfully painted trucks all competing for every inch of the crumbling road, which, incidentally, is made by hand – open fires melting the road tar and workers smashing rocks in the hot afternoon sun (but still wearing trousers and woollen vests!) I thought it must be somewhat satisfying to build a big concrete bridge by carrying loads of cement on your head. Good food, as long as you don’t see them prepare it. Cheap (if you avoid the tourist traps), but correspondingly dysfunctional, run down, and filthy. It sure is good to get away from it all. Arriving in Delhi we did just that – took a taxi straight to the free flying mecca of Bir in the Himalayan foothills. Twelve hours later we arrived to the sun setting on the last good day for quite some time. Our friends had flown the classic flight to Manali, giving themselves several days to return as the thunderstorms set in. Those thunderstorms would become one of the defining aspects of the trip. A week later and I was wondering whether we should visit the deserts of Rajastan, with fellow kiwi Bryan clinging tenuously to sanity as the days slipped away for our vol bivouac mission. I noted that to start the vol biv you needed to get out of range of the Bir magnet, but adjusting quite well to Indian chai tea and my mostly waterproof accommodation option I did not feel the need to escape. The local independent weather forecaster issued reliably morbid forecasts and we had done our share of waiting in cloud and getting hailed on. Finally we commenced our vol biv and things went well, for a time. Although we made good progress, most of the flying was low over forest and cultivated terrain. With limited landings and plenty of cables to watch for you might say it was good practice for flying in the Alps, although I think in general the Alps is far worse for cables and generally a much nicer place to try and find a launch. Right from the outset (particularly after reading Luc’s vol biv account) I was worried about trees, which really were a problem. Terraced fields are horrible places to take off from and otherwise with trees reaching up to 3500 metres you really start to encounter problems. Once in the air, generally the features are very well defined, with vultures being a delightful cue to help you find your way to the next thermal. It turns out that Himalayan thermals are hard to find, at least those I would consider worthy of such an illustrious mountain range. Fond memories of wrestling with a particularly strong and unkempt climb to rise above a snowy craggy peak are unfortunately hard to replicate when I look back at the trip. There was more time spent scratching around in light and fickle flying conditions under a soup of mid and high level cloud before the day suddenly transitioned to racing around fast building storm clouds as the higher ranges went dark with falling rain, hail, and snow. In the latter stages of the trip the weather deteriorated yet again and with the main Himalayan chain obscured by lingering cloud build up I lost my motivation. With his direct and bold style Bryan was forging ahead but with cloud base lower than the tree line he too began to question his motives. 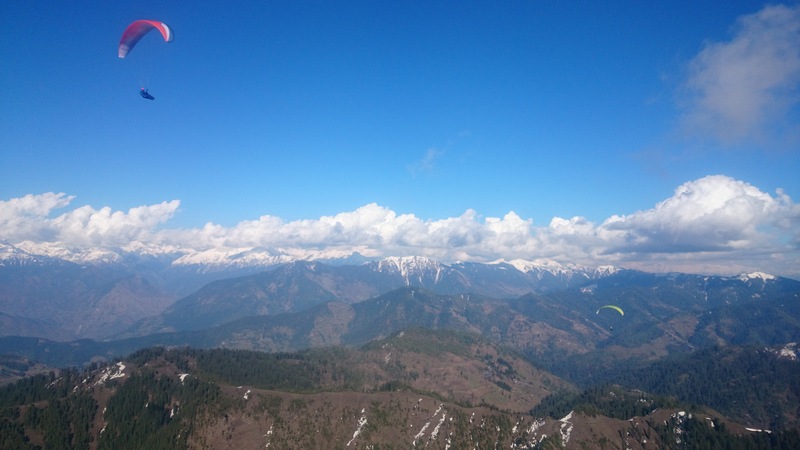 We retreated to Rishikesh to regroup and clarify our goals – and decided that our best chance to mix it up with the big mountains was to position ourselves in Manali. A couple of good days passed as we negotiated the Indian road network once more but the thunderstorms faithfully returned once we reached Manali. After a period of bizarre mist or haze we had one of the most incredible periods of thunderstorm activity I’ve ever heard of – twelve hours of unrelenting lightning and rain through the night. Another day and it finally settled down and we were invigorated to see a clear morning sky. 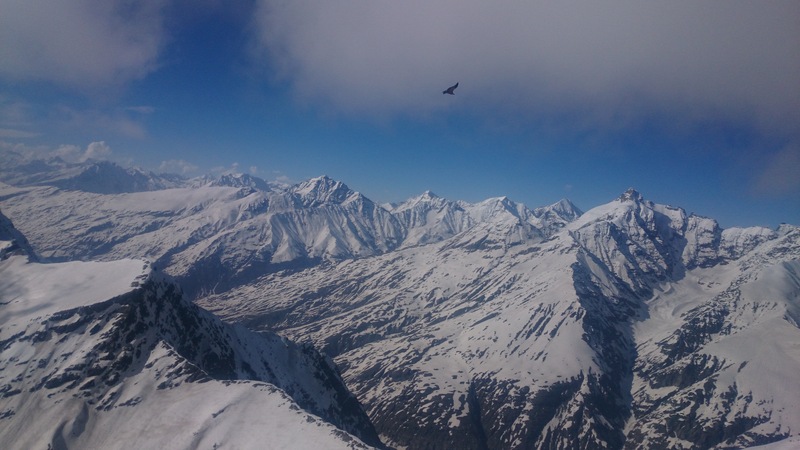 Nothing as invigorating though as the fierce katabatic Rohtang wind which was just around the corner, gusting up to 60km/h and only abating after midday – but thankfully we were still on the hill, and could finally get into the air. At long last we got what we’d come for – climbing up over 5000 metres with panoramas of snowy peaks into the distance. It’s not just my spoilt attitude and tendency to complain – this pre-monsoon period in the Himalaya has been unseasonably awful. Farmers have lost two thirds of their wheat crop, the plight of apple orchards threatens the local economy, and over the Rohtang the fields which are normally planted in early March are still under one to four feet of snow in late April. Clever armchair paragliders back at home had asked why we hadn’t gone north to Leh to escape the humidity, but you only had to take one look over the Rohtang pass to see the legitimacy of that. Anything less than sheer cliffs was pure white, with snow all the way down to the valley. In any case I think we were in the right place to spend the last good weather of the month. Pilots in Bir were coasting back and forth on the Dhauladars racking up the miles but I’d personally rather be up close and personal with big snowy faces, diving over high mountain passes and being surrounded by untouched nature. I decided to spend my last night in a high mountain rock bivouac. Before descending into the busy chaos of India I enjoyed solace and a little excitement as I sheltered from the hail and watched the lightning illuminate the snow encrusted mountains. Enter your email address to follow Nick Neynens progress in the X-Alps race. Enter your email address to follow Kiwi paragliding and receive notifications of new posts by email.